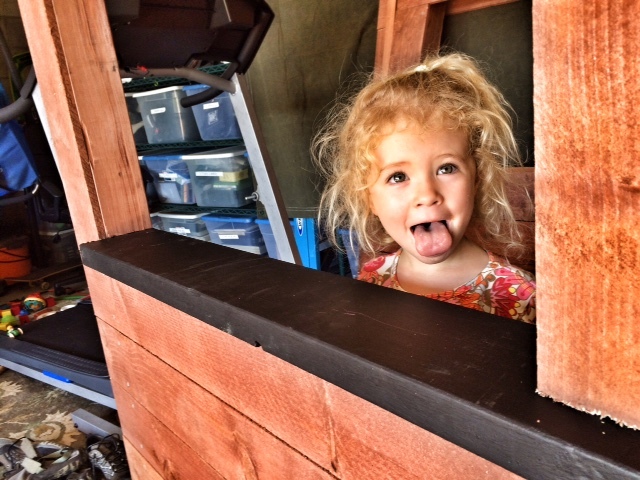 This is most likely the last post about the playhouse before it’s finally done. I actually think that waiting for the next month and half to put it together will be harder than building itself. 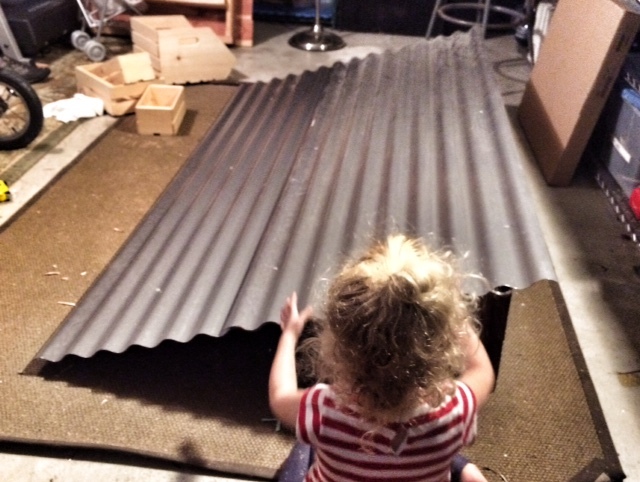 This past weekend my little helper and I put together the roof, built the front wall, and painted some shelves. The first thing that we had to do was to put together the front wall. Again, because the shape of the whole thing has to be narrow in order to fit in our yard, I’ve decided to have the front and sides completely open so that it isn’t too claustrophobic inside. And for a little extra fun I made a counter top that I painted with black chalkboard paint, which gives the whole thing a nice contrast to the redwood. For the roof I really wanted to use corrugated roof panels again (see compost bin) for no other reason than I just liked the look of it. But instead of using metal I used polycarbonate so that it wouldn’t have any sharp or rusty edges. 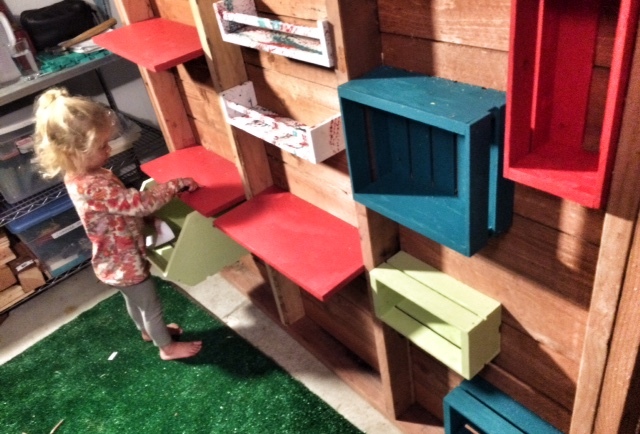 Finally, we decided that it would be fun to put in some shelves so that she could store her ‘stuff’ inside the house. There was a huge sale a local craft shop so I bought some shallow crates that we arranged, painted, then attached to the back wall. I think it gives it a nice splash of (possibly obnoxious?) color. And we only managed to ruin one pair of pants! 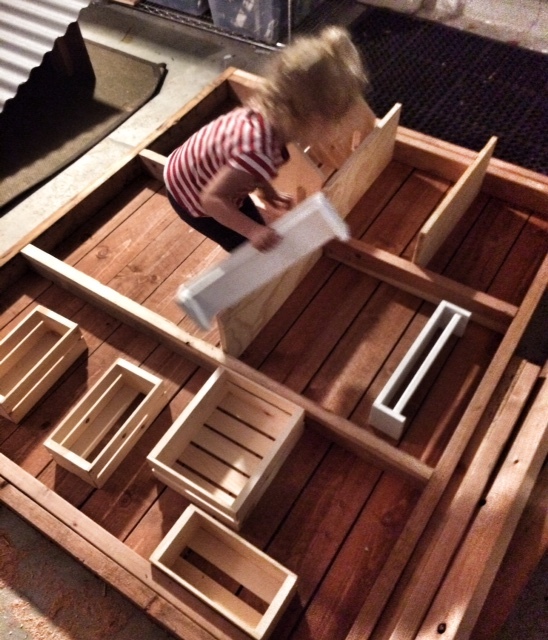 Next: Playhouse – Part IV – Finished!